If you’re someone that loves coffee, having a coffee shop near your home is essential. Not only are coffee shops great places to grab an early morning caffeine boost but they are also vital meeting points and workspaces for many of us. If you’re looking for an awesome coffeehouse that is just around the corner from your home, we recommend these five central coffee shops. Located only a 5-minute walk from Mondev’s B&C Apartments*, this coffee house claims to have brought the Third Wave of Coffee movement to Montreal. The Third Wave of Coffee movement coffee is a refined, artisanal product equal to wine or chocolate. The founder of Saint-Henri Micro-Torréfacteur is an enthusiastic proponent of this movement and roasts the coffee beans himself to bring you one of the best cups of coffee that you've ever had. * B&C Apartmentsare chic apartments located in the Ville-Marie district. They offer residents a variety of upscale amenities, including a rooftop terrace, a lounge area, a gym, and indoor parking. An excellent place to live for those who want to live close to downtown Montreal and the exciting Quartier des Spectacles. Situated only a 2-minute walk from Le Rolland Condominiums* and a 10-minute walk or 4-minute cycle from Les Berges du Canal Urban Condos*, this is a popular Italian café and sandwich counter in Saint-Henri that specializes in exceptional cups of coffee as well as deliciousflavourful sandwiches. Try their juicy meatball sandwich or their vegetarian brie, green apple, honey mustard and tomato sandwich, both of which are to die for. * Le Rolland & Les Berges du Canal Urban Condominiums are bothlocated near the Lachine Canal and offer residents easy access to the Canal's 15 km bike path as well as the many delightful art galleries and restaurants in the Saint-Henri district. Le Rolland consists of twenty-one new 2 and 3-bedroom condos with hardwood floors. Les Berges du Canal has 1 and 2-bedroom condos for rent with a large rooftop terrace that offers exceptional views of the Lachine Canal, downtown Montreal, and Westmount. 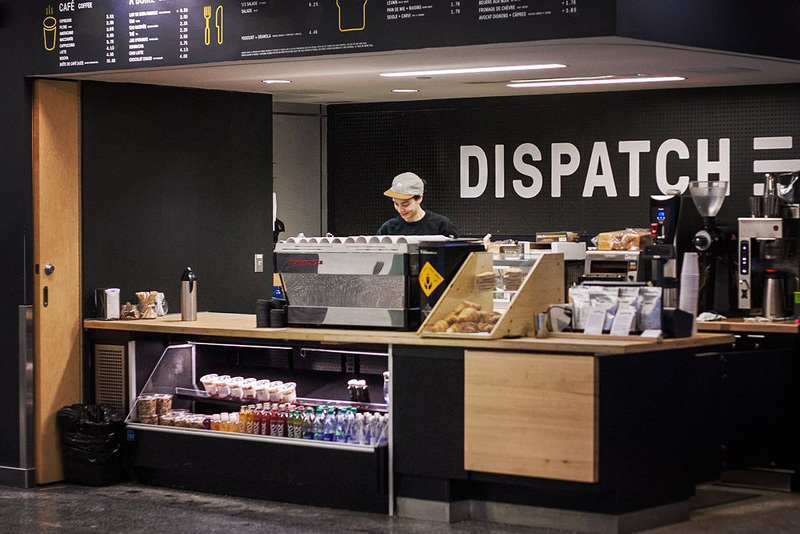 Merely a 10-minute walk from Carter on the Park*, Café Dispatch is committed to quality coffee, sustainability, and innovation. They source their coffee beans from countries all over the world including Columbia, Ethiopia, and Rwanda. They lightly roast their beans on-site yielding delicious cups of coffee that accentuate the natural flavours and sweetness of the beans. * Carter on the parkfeatures1 to 3-bedroom apartments for rent near Jarry Park, Jean-Talon Market, and Little Italy. Every unit has large windows, includes six appliances and most have two bathrooms. There is also underground parking, storage lockers, a 24-hour gym and an outside courtyard with a garden available to renters. Occupation of these apartments begins July 2017. Located on Amherst Street near Mondev’s GLO 2 Apartments*, this stylish espresso bar brews up tasty cups of coffee from around the globe. This is a wonderful place to meet friends or sit back and read a book while enjoying a great cup of coffee. If you’re vegan, lactose intolerant or if you just want to try something new, get a latte made with their homemade almond-coconut milk. * GLO 2 Apartments is located near the Village, just south of Rene Levesque Blvd near Wolfe. They are the perfect apartments for those who would enjoy living in one of the most fun and colourful districts of Montreal.